After experiencing challenges in deploying its business model from the US mainland to Hawaii, conservative is the key word underpinning Allegiant Air’s strategy to expand into the Mexican market, which will appear in the carrier’s route map in Jun-2014 when it deploys flights to Mexico from its largest base and headquarters of Las Vegas. Mexico has been on Allegiant’s radar even before the carrier first tabled plans to introduce service to Hawaii in 2010 and finally launched its Boeing 757-operated flights from the US mainland to Hawaii in 2012. As far back as 2008 Allegiant mentioned Cabo San Lucas/Los Cabos, Puerto Vallarta and Cancun as potential destinations that would fit its model of introducing service from smaller US markets to large leisure markets. Allegiant also launched its Hawaii platform from Las Vegas and still operates two weekly flights on the pairing even as it is adjusting capacity in some of the smaller markets it serves from Hawaii as filling the 217-seat aircraft (check this) has proven to be a challenge. Perhaps examining some of the knowledge it has acquired in operating to Hawaii, Allegiant has so far applied to serve only two Mexican destinations, and executives are striking a cautious tone in their approach to Mexico, stressing overall its Mexican operations will play a very small role in Allegiant’s operations in 2014 as its fleet will remain relatively stable during the next couple of years once a mix of Airbus A319s and A320s are delivered. That’s somewhat different from Allegiant’s original plan to deploy six 757s to Hawaii. During 2012 after the initial Las Vegas-Honolulu launch, Allegiant introduced flights from Fresno, Santa Maria and Stockton, California to Honolulu as well as service from Bellingham, Eugene and Spokane, Washington to Honolulu. The carrier also introduced service from Bellingham to Maui. Based on current schedules in Innovata, Allegiant now only serves Honolulu from Bellingham and Las Vegas, and has retained the Maui-Bellingham service. The carrier has cut several markets on a seasonal basis, and has not guaranteed all those services will return. While Mexico is different in that Allegiant needs route authority approval to launch service, the company does not seem poised for a rapid transborder expansion. “We’re going to grow it [Mexico] conservatively and just react accordingly and learn as we go,” company president Andrew Levy recently stated. Much like the US west coat to Hawaii, the Mexican transborder market is also quite well served by US carriers who represent the largest portion of the total number of seats on offer. 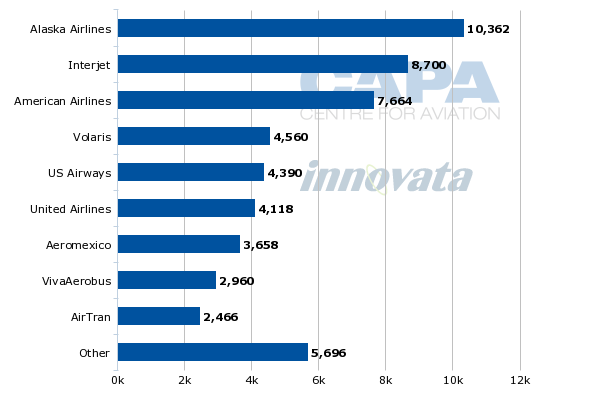 Current schedules in Innovata (1-Sep-2013 to 7-Sep-2013) show that American Airlines accounts for 21% of the seats on offer between the US and Mexico, followed by United with 19% and Mexico’s largest carrier Aeromexico with a nearly 18% share. Data from the Mexican Government show the country’s international passenger traffic on foreign air carriers continues to grow, increasing from 1.9 million from Jul-2012 to 2.1 million for the same time period in 2013. 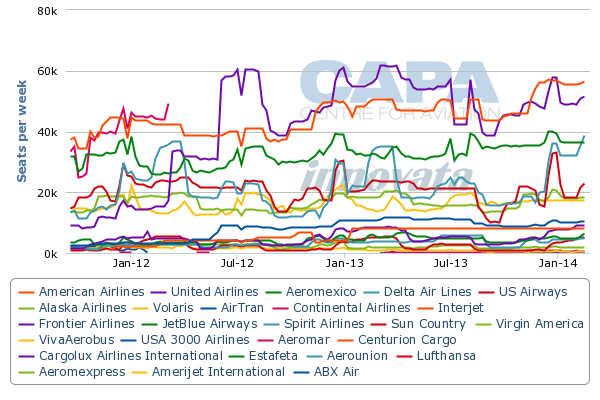 During Jul-2013 American carriers accounted for 56% of Mexico's scheduled international passenger traffic. Allegiant’s selection of Hermosillo may seem odd as the city located in the northwestern portion of the Mexican state of Senora is not a huge tourist mecca. But part of Allegiant’s stated strategy in Mexico is bringing in-bound international passengers into large US leisure destinations such as Las Vegas. Mr Levy told the Wall Street Journal earlier in 2013 that Allegiant believes there is an opportunity to tap into the building demand growing among middle class Mexicans that have few nonstop flight opportunities to US leisure destinations. The spate of Mexican low-cost carriers that has emerged within the last decade – VivaAerobus, Volaris and Interjet – have essentially based their models on tapping the increasing discretionary spend of the Mexican middle class, with nuanced takes on penetrating that market. Hermosillo, which is the capital of Sonora, seems to fit Allegiant’s route profile as no nonstop service currently exists to Las Vegas. Aeromexico offers one-stop service through the tourist area of Puerto Penasco from Hermosillo to Las Vegas. Hermosillo’s economy is based largely on manufacturing, and The Ford Motor Company has a significant presence in the region. Generally, Sonora is considered one of the more prosperous Mexican states, which should mean there is some demand for travel to a high-profile leisure destination like Las Vegas. Presently, American and US Airways serve Hermosillo through their regional partners from their hubs at Dallas/Forth Worth (launched in Jun-2013) and Phoenix. Aeromexico also offers flights from Hermosillo to Los Angeles. With just two weekly roundtrip flights, it doesn’t seem like a huge gamble for Allegiant to garner interest in flights to Las Vegas. However, the carrier has never marketed its ultra low-cost brand in a foreign point-of-sale market, so it needs to learn the nuances of how to build a base of Mexican travellers in Hermosillo. Previously, Mr Levy has remarked that Allegiant does not expect to have a different distribution strategy in its secondary Mexican markets, noting the carrier has concluded it can effectively sell its product through its website. He stressed Allegiant believes it can be “very effective” in going direct to the customer; however, Allegiant’s president did remark if the company needed to modify that strategy it would do so. Allegiant’s planned service to Los Cabos international airport (which serves San Jose del Cabo and Cabo San Lucas), is a more straightforward market as it is a popular leisure destination served by several US carriers. Current schedules in Innovata show that American serves the airport from its Chicago and Dallas hubs, US Airways offers flights from Phoenix and AirTran operates service from Detroit and Santa Ana John Wayne airport in Orange County. Alaska, which is Los Cabos’ largest carrier in terms of seats deployed, operates service from Los Angeles, San Jose and San Diego. Spirit also flies to Los Cabos from San Diego. Outlining Allegiant’s rationale in initially offering service to Los Cabos from a larger market like Las Vegas rather than its typical smaller city market such as Boise, Idaho, Mr Levy noted that Allegiant has a well-established customer base in Las Vegas. “Over time, we do expect to serve Mexican vacation destinations like Cabo, like Cancun from many of our smaller city markets,” said Mr Levy. Presently, no carrier serves either of those destinations from Las Vegas. Aeromexico and Volaris operate service to Mexico City Juarez while Interjet offers service to Mexico City Toluca. It should be an interesting exercise for Allegiant to operate service between two highly concentrated leisure markets, but Las Vegas is one of the last-standing markets to Honolulu, so perhaps there is enough demand in Las Vegas to sustain the year-round service Allegiant plans to introduce. Allegiant told US regulators it plans to operate the flights to Hermosillo and Los Cabos with 166-seat MD-80s, which still remains the backbone of the carrier’s fleet despite its work to add Airbus narrowbodies in the coming years. A key point Allegiant’s management stressed when it revealed plans to introduce Airbus A319s during 2H2012 was the flexibility the aircraft offered as its MD-80s continued to depreciate. Depending on market conditions the 19 aircraft (at that time sourced from Cebu Pacific and easyJet via GECAS) allowed the carrier to spool up or down if necessary. Management also stressed the 156-seat narrowbodies would also be ideal for the short-field performance necessary at some Mexican airports with hotter temperatures and higher altitudes. The A319 was also cited to potentially open up more smaller markets in the US. But the deal to lease 10 of the A319s from Cebu Pacific ultimately fell through, and Allegiant opted to purchase nine 177-seat A320s from Spanish carrier Iberia. In its 2012 annual report, Allegiant projected operating two A319s and seven A320s at YE2013, and expects to operate nine A319s and nine A320s by year-end 2015. The shift to a higher-gauge 177-seat aircraft joining its 166-seat MD-80s and now the smaller than expected fleet of 156-seat of A319s is interesting given it provides Allegiant an ability to shift aircraft in certain markets by about 20 seats. Recently executives explained that seven of the A320s should by incorporated into its operations by the US Thanksgiving holiday in late Nov-2013 as the carrier’s schedule to warm weather destinations starts to ramp back up for the winter season. Allegiant believes the higher number of newer Airbus narrowbodies in its fleet relative to the older, less fuel-efficient MD-80s should provide unit cost advantage to the carrier during 2014. In its most recent guidance Allegiant expects a 7% to 9% rise in unit costs for 3Q2013 and 2% to 5% for FY2013. By year-end 2014, Allegiant expects its Airbus fleet to represent between 18% to 20% of its scheduled capacity, which underpins the company’s belief that the Airbus narrowbodies that consume (based on 2012 block hours) less than 225 gallons per block hour than the company’s MD-80s. But Allegiant for the foreseeable future plans to keep its MD-80 fleet at 51 aircraft to ensure it achieves favourable pricing on Airbus narrowbodies. The company’s management has stated the MD-80 fleet will remain flat until at least 2015 or even beyond. As it is able to acquire more Airbus narrowbodies as prices it deems attractive, Allegiant’s executives have remarked that it would retire MD-80s as they reach their heavy check periods. Responding to a query about stabilising prices on previously operated Airbus narrowbodies during the last half-year, Allegiant executives remarked that the company is an opportunistic lessee and buyer, and in the long-term the market place for current model Airbus narrowbodies will be sufficient to satisfy its needs at prices that make sense for the carrier. The re-engined Airbus A320neo has an entry-into-service date in 2015, so during the next two years Allegiant could see more attractive prices for current engine models. Less certain is the fate of the six 757s that were originally acquired to support Allegiant’s Hawaii operations. Mr Levy has candidly concluded that if the company cannot successfully execute a strategy to exploit the seasonality of Hawaii to support year-round operations of those aircraft at acceptable margins, “then the answer is to go to zero”. But he cautioned it was too early to tell predict the outcome of Allegiant’s foray into Hawaii. Allegiant’s candor in stating that it is in the midst of a learning curve in its Hawaii operations is commendable as the company is learning that replicating its successful strategy of linking smaller US cities with large leisure destinations is not easily replicable outside the continental US. It appears the carrier is taking the long-view of transborder service into Mexico, and developing a conservative expansion plan into Mexican leisure markets. It is a wise decision as at the time it plans to introduce new Mexican markets Allegiant should have a handle on whether it can truly turn a corner in its Hawaiian operations.